Or I should say, watching Huguette shop, a repeat of former outings, when my longtime friend ushers me through hip shops, with great brio. Last year I felt sorrowful, because nothing fit me, an American 12-14; now I ride along for the edification, as if visiting a museum. 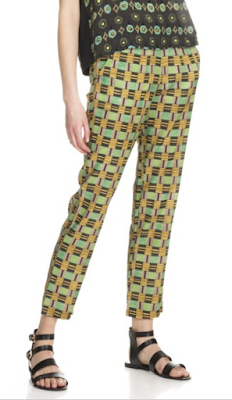 But if you are a size 6 or 8 with a thin frame and a fat wallet, Momoni, an Italian company with audacious silk prints, would please. As the aria goes, La Donna è mobile, and none more "mobile" than a clothes-collector Parisienne. Out with former flirtations (Cotelac, Maje, Irie), in with the new. She likes wild pattern mixing and quirky proportions and finds my wardrobe much less daring than when we met. She's right! When I asked if she ever wore jeans, she had to stop and think. She whisked into NorieM—Japanese clothes and shoes, the exact flats on the model below, which edged over $US 400 and that was with a 'preferred client' card. You can't see the back detail, which offers a little tab like a cat's tongue that rises from the heel, and therefore those in the know see that these are not Clark's. Such cognoscenti codes are the lifeblood of this sensibility. Shoes here seem expensive to me, but it may be where we were shopping (Carrefour Croix Rouge), and the sturdy pair she bought accommodate her bunions. I'm all for taking the hit on quality shoes that treat your feet kindly. NorieM clothing is made from plush natural fibers, often hand-dyed, in the modern Japanese style—not simple like Eileen Fisher. It requires a devoted approach: you need to wear the whole look. 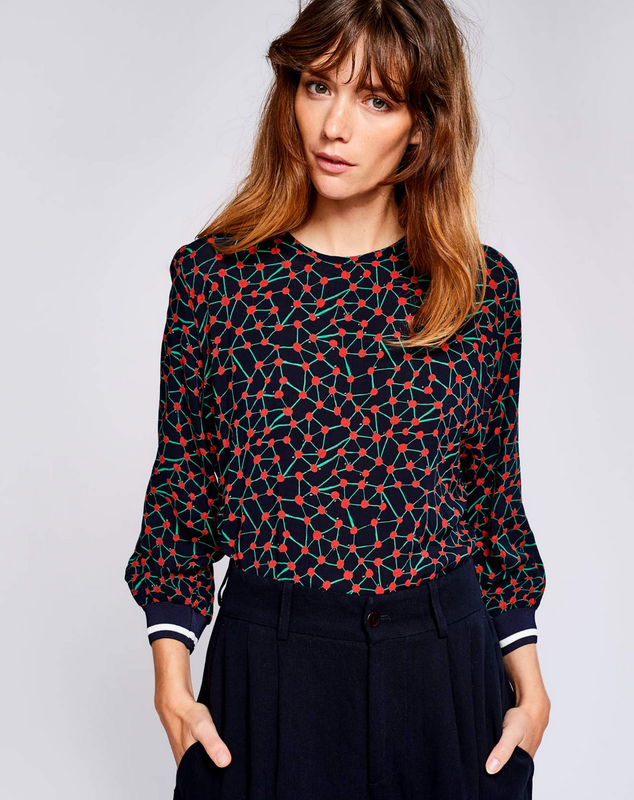 Another current favourite is Bellerose, where I admired touches like knit sleeves on the viscose Solong shirt; small details elevate the design. After our tour, I realized it takes a population of women who understand these clothes and will thus make the investment to support such designers. (All shown have boutiques elsewhere.) I was sorry to see that one I long liked in our neighbourhood, Eunhwa, was gone. I asked that we stop in when we passed Uniqulo, and now have a new tee from their Marimekko collaboration, of which Huguette approves, and so does my budget— it was under $20. The next post will be on Tuesday, May 22. Love your 'art gallery' approach to shopping with your friend. And some of those looks are a hoot - the Japanese style reminds me of the Motion style here in Toronto. I always wonder who wears these clothes...they clearly live a very different life. It's all great fun and explodes the myth of the chic Frenchwoman with her minimalist closet of basics:-) I think your tee is super, such a pick me up to put on in the morning. Actually, your very low-priced t is the garment I like most among those shown. It takes a certain posture and body type to wear that Japanese outfit, not merely slenderness. I like the cuffs on the shirt, but it looks like a garment one would have to do up in the back. Still, it is good to look at unusual clothing that is well-made. And if one has the money and the need, 400$ comfy and supportive shoes are not a luxury. LauraH: I see a good number of women in the oversized "Lagnenlook" style both in this city and yours. Nearly all are over 40, but occasionally see someone younger. They are either working at home, in very casual business environments or like 'arty' clothes. I met up with another women, a Canadian, here in Paris. That's her look and she is confident and happy in it. These clothes are not 'strict', another clothing meme. Strict shows the body, but without embellishment, or any kind of frill or that 'pop of colour' thing. Strict is clean, very well cut and not voluminous. Usually expensive but some of the Scandinavian brands are reasonable. lagatta: Thanks, not sure how much I will wear it, but for the price,not worrying. This trip I was gobsmacked by the prices, such as €260 for a simple linen top or €450 for a linen dress which is just a rectangle with sleeves not even set in. I am confused about who wears these shapeless clothes. Tall and thin obviously (and well off), but even then they don't seem to flatter even the models. I like your idea of looking at this as an art gallery tour. I think I'd choose an anthropological approach. I'd take the minimalist Scandinavian look over these any day. I loved seeing these clothes and reading your notes on them, thank you. It is so much fun to window-shop in Paris. 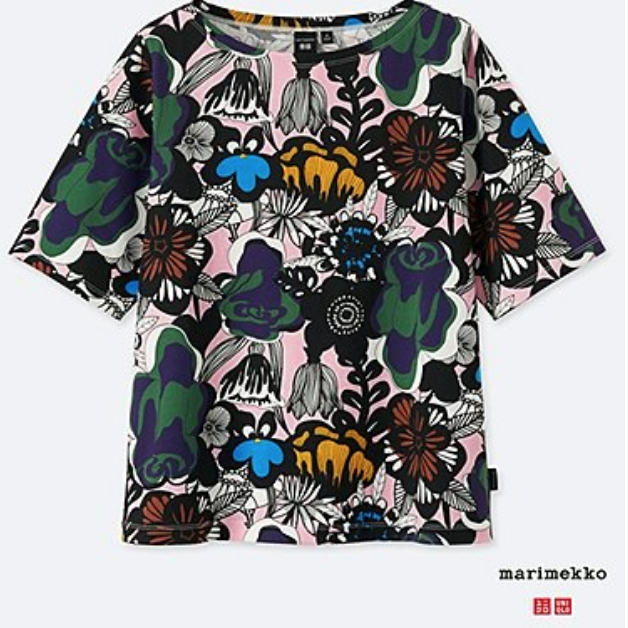 The Marimekko tee shirt is adorable! I love Marimekko too. I love your approach to looking at and describing the clothes for us. I feel very boring, except for the Uniqlo tee, which I would buy, although I know women who would wear these looks and look fabulous. I love Uniqlo's tees and pick one up whenever I have the opportunity. love your comments and tips on Paris. I have just returned to London from a week in Paris and no-one was wearing complete outfits like these. However, women of all ages were wearing similar individual elements such as a shirt with jeans, a skirt with a denim or leather jacket. Paris style is rarely matchy-matchy, in my experience. Plus two tips, look round the Monoprix supermarket clothes range. They have very good linen shirts, dresses trousers and excellent well -made jeans. My other tip is, if you need to buy household linens then head for the Marche St Pierre, near Montmartre and if you are a dressmaker there is Sacred Coupe selling 3 metre lengths of last seasons designer fabrics nearby. The thing that surprised me most? Being the only visitor at the Azzedine Alaia: Je suits un couturier show in his old atelier in the Marais. It is only 5 Euros and was absolutely my stand out visit this week.